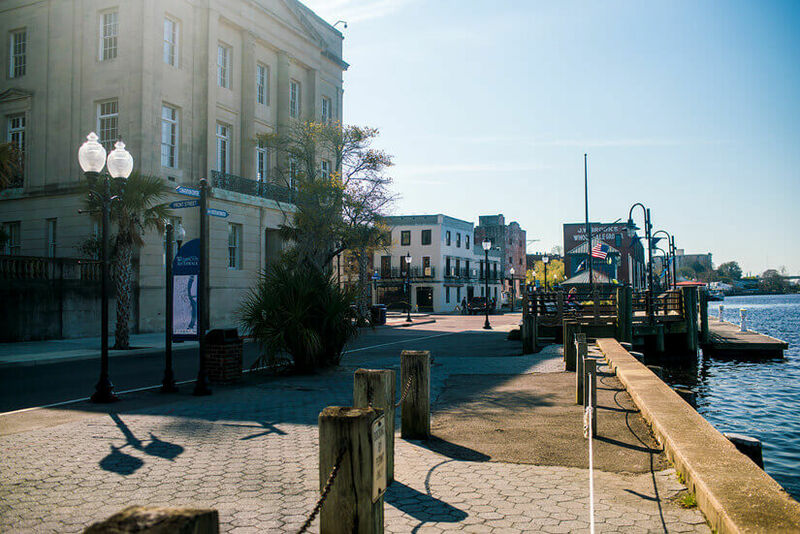 Throughout our visit to Wilmington, North Carolina, we were continuously surprised with the fascinating history, culture, museums, nature, restaurants, and bars in the city. We spent the weekend exploring one exciting stop after the next and had a wonderful time. Our base for the weekend was Hotel Ballast Wilmington, which is a part of the Tapestry Collection by Hilton. 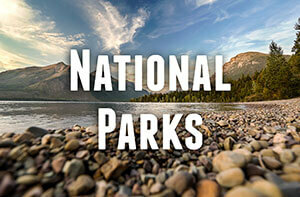 It’s located right along the river with direct access to the Riverwalk and in the heart of all the action. The Cotton Exchange, Front Street, and the Railyard are all a short walk away. We were on the go for most of the weekend, but we still found time to relax and just wander around the city. 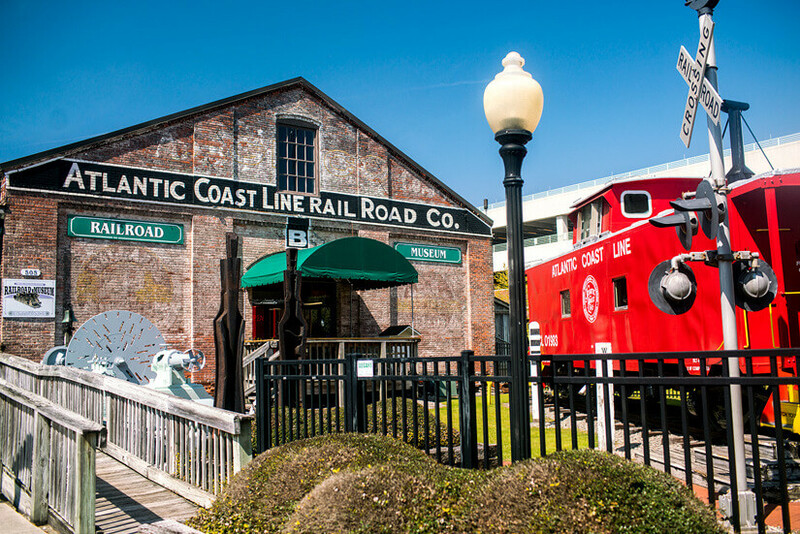 Check out our full weekend itinerary for Wilmington below! After our short drive over from Wrightsville Beach, we started our city exploration with a self-guided walking tour of Wilmington. We downloaded the Wilmington.tours app and followed the path for the Civil War tour. There are 13 downtown stops on the tour and five stops within driving distance of downtown. The downtown walking portion of the tour takes about two hours at a leisurely pace, and each stop has an audio recording and transcript to go with it. We stopped at the Bellamy Mansion, Custom House, DeRossett House, Thalian Hall, and more. We learned so much about the city during the war. 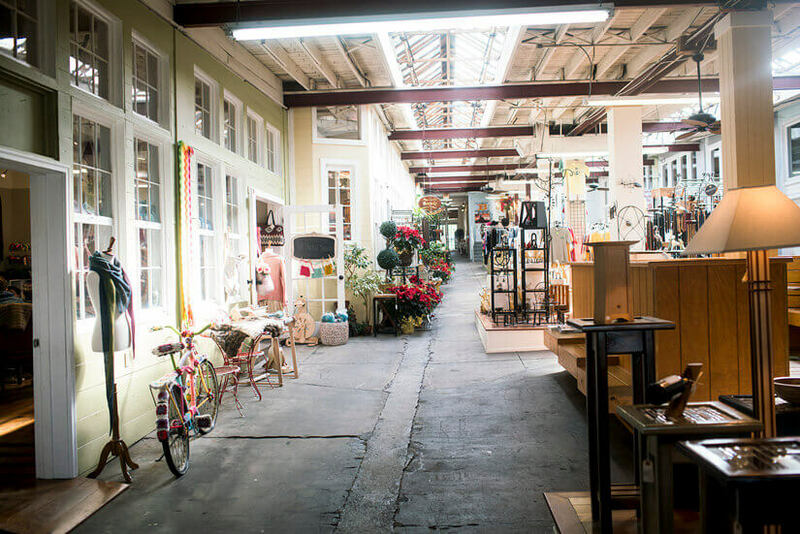 The National Register Historic District spans more than 230 blocks–one of the largest in the country. Wilmington was the last major open port of the Confederacy, and after its fall in 1865, the war soon ended. Some of the stories we heard were about underground railroad stops, women of the war, and the city’s red-light district of the past. 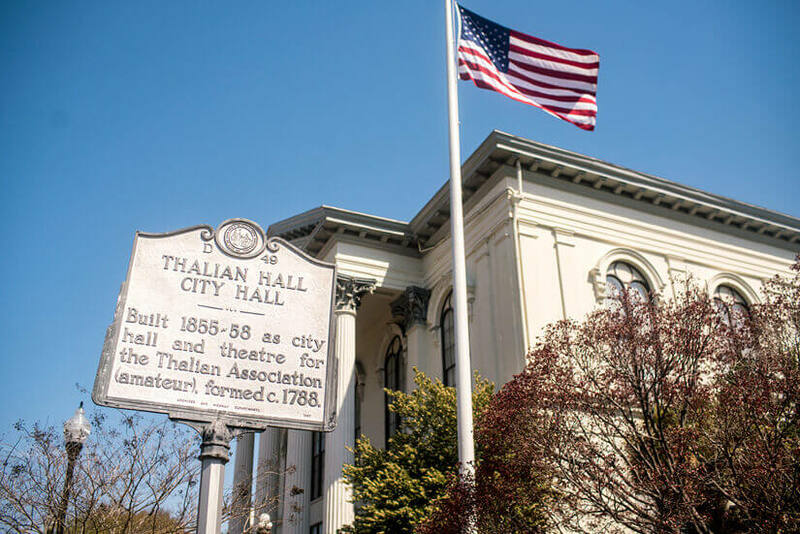 If you are interested in history and the Civil War, this tour should definitely make it onto your Wilmington itinerary. The sun was starting to peek out from behind the clouds, so we decided lunch on the riverfront would be a good idea. We settled in at our table on the patio with views overlooking the river, and we perused the menu full of “Southern Coastal Cuisine.” My Coastal Carolina Shrimp Po’Boy and Micah’s Chicken Club were a tasty way to start off the weekend! After lunch, we spent some time exploring Wilmington’s historic district and the Riverwalk that skirts the Cape Fear River. 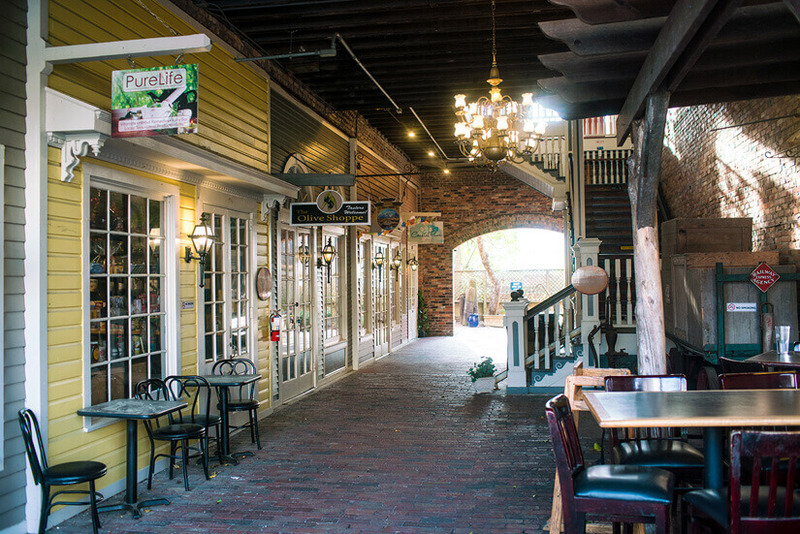 We browsed shops like Island Passage Elixir, Cape Fear Spice Merchants, and Lure, as we soaked up the old architecture all around us. And, of course, I couldn’t resist walking along the Cape Fear Riverwalk. One of my favorite childhood shows, Dawson’s Creek, was filmed in Wilmington, and the Riverwalk was in many scenes throughout the series! The beer scene in Wilmington is literally hopping these days. There are plenty of breweries and bottle shops to visit along the Ale Trail, and we had the chance to check out three of them during our visit. Our first brewery stop was actually at the Wrightsville Beach Brewery when we were in Wrightsville Beach earlier in the week. 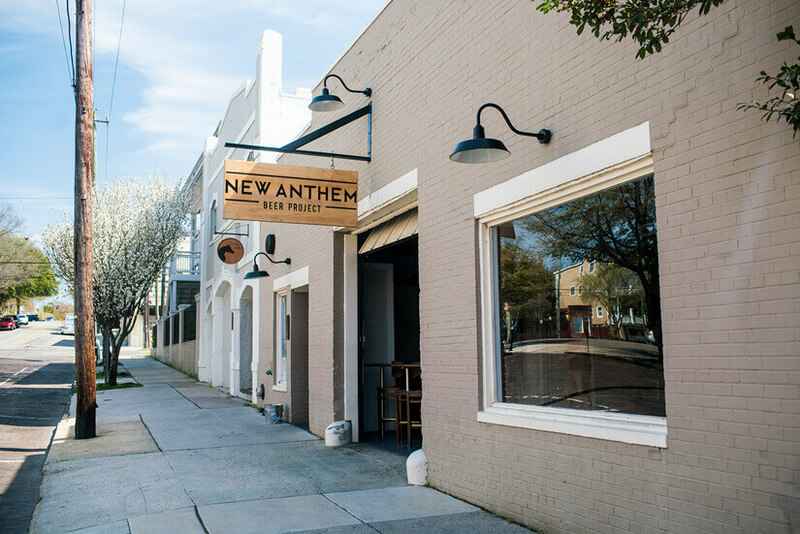 As for breweries in Wilmington, we visited New Anthem Beer Project and Front Street Brewery. First up was New Anthem Beer Project. We really enjoyed the atmosphere of this brewery, and our flight of beers was great. 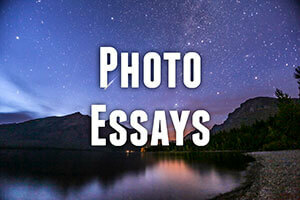 We tried the Preachy, Gutter Poet, and First Blush of Sin. Next up was a brewery tour at Front Street Brewery, one of the oldest breweries in the city. Front Street Brewery opened in 1995 and offers free brewery tours with a tasting every day. We’ve been on several brewery tours over the years, so we were happy to find that this one was different from any of the others we’ve attended. The head brewer gave us some interesting insights on the flavor profiles and combination of ingredients that go into making beer. The free beer samples were a nice touch, as well! For a bit of spooky fun, we joined a ghost walk of Old Wilmington next. Since Wilmington has such an interesting historical background, it was the perfect place to hear ghost stories from the past. Our guide, John Henry Scott, is an actor, and he was a great storyteller. We followed him throughout town and stopped at many historic sites along the way. We heard five stories during our tour, a few of which involved a captain and his dog dying in a fire, someone being buried alive, and a woman biting off a man’s ear. One aspect of the tour we really appreciated was that all of the stories were well-researched and historically accurate. Whether the ghost portion of the story was true didn’t even matter. The stories on their own were interesting and creepy enough, and it certainly explains why Wilmington is considered to be one of the most haunted cities in the country! After a full day of walking, it was time to wind down the evening with a late dinner at Benny’s Big Time Pizzeria. This restaurant, located a couple of miles from the core of downtown Wilmington in the South Front District, is the newest concept from celebrity Chef Vivian Howard. We arrived around 8:30 p.m. and the restaurant was still packed with the dinner crowd. There weren’t any available tables, but, thankfully, there were a couple of seats open at the bar, and we happily snatched them up. We loved the warm, inviting atmosphere of Benny’s Big Time, and our food and drinks were delicious. I ordered the chopped salad, which came with radicchio, salumi, provolone, pickled egg, chickpeas, and orange vinaigrette, and then we went simple with the pizza and ordered the Tony Pepperoni. We loved the names of the different pizzas, especially the Kevin McCallister and the Talk’in Shiitake—restaurants with a sense of humor are the best. The Saturday of our visit also happened to be St. Patrick’s Day. We were welcomed with a morning parade, but we actually had our eyes on brunch at The Basics instead—first things first, am I right? There would be time for holiday celebrations later in the afternoon. The Basics is located right downtown on Front Street, and it serves Southern comfort food with fresh, local ingredients. I really enjoyed my spinach feta grill, which came with poached eggs, creamy spinach sauce and artichoke hearts on French bread. Micah had the French toast, which was tasty as well. It was definitely a great way to kick off the day! We had a food-filled day in front of us, so a walk was certainly in order. The Castle Street Arts & Antique District sounded like a great place to do some browsing, so we walked just over a mile and spent the rest of the morning popping in and out of a variety of shops. A mid-morning pick-me-up coffee was also in order, so we took a quick break at Luca Café, too. After stopping by the St. Patrick’s Day festivities along the riverfront and catching a few Irish-themed songs, it was time for our next adventure of the day. We were going on an Downtown Tasting Tour with Taste Carolina. Our food tour lasted around three hours and included six stops throughout the city. We were treated to stops at Pilot House, City Club of Wilmington, Savorez, Chops Deli, Bella’s Bar Local, and Peppered Cupcake. We had dishes including mahi-mahi with rice, beans, and pineapple salsa, St. Patrick’s Day-themed cocktails, and a to-die-for taro cupcake. In addition to visiting some really delicious restaurants, we also learned more interesting history about the city. Once the food tour was complete, we stopped by the holiday festivities once again and then had to take a break for the afternoon. 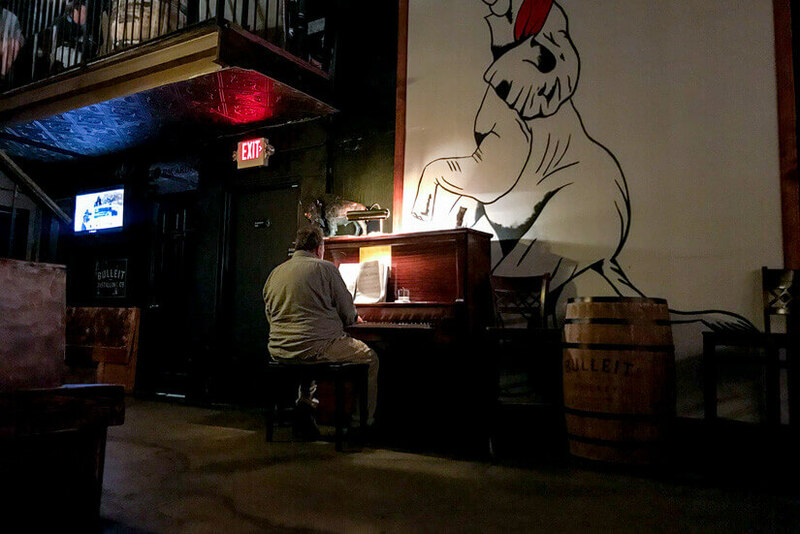 Later that evening, we found it in ourselves to rally and went back downtown to check out the Blind Elephant Speakeasy. This 1920s Prohibition-style speakeasy bar is located down a dark alley, and to gain access you climb a stairway and knock on the door. We enjoyed relaxing on one of the comfy couches, listening to live piano music, and sipping on creative cocktails. We weren’t quite ready to call it a night after the speakeasy, but we weren’t exactly hungry for dinner after our food tour either. So, we ended up visiting manna for appetizers and drinks. Manna was the first restaurant in Wilmington to receive the AAA Four Diamond Award, and the cocktail list is top notch. Since we just wanted something small to snack on, we grabbed a seat at the swanky bar. We noshed on the berry manna loaf, which was bread with manna butter and jam, as well as the cheese-and-charcuterie course. Sunday was our last day in Wilmington, but there was plenty of time to still explore since we had a late-evening flight home. We started off our morning with breakfast at Sweet N Savory Café, which is actually going to be on an upcoming episode of Diners, Drive-Ins & Dives! It was hopping on Sunday morning, and we had a bit of a wait to get seated, but it was well worth it for my K.I.S.S. Plus, which was eggs, cheese, and bacon on a flaky croissant. Yum! 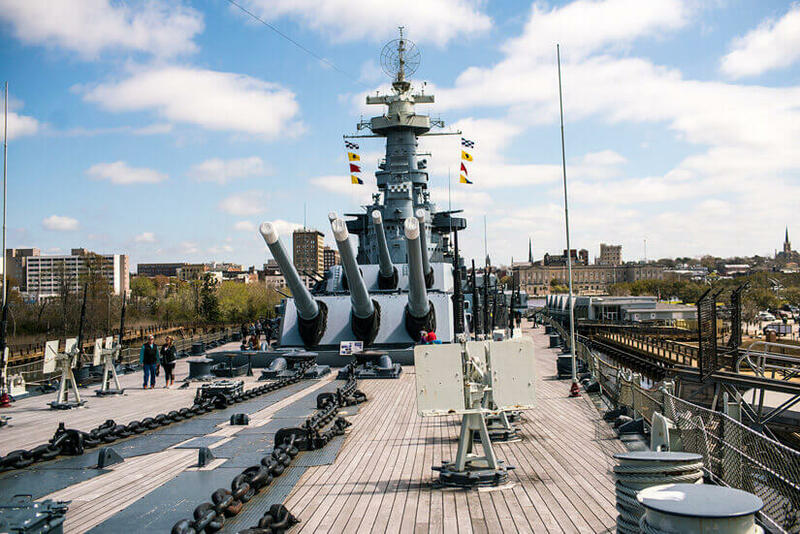 The Battleship NORTH CAROLINA, a restored World War II battleship, opened in 1961 as a memorial for the 11,000 North Carolinians who died during the war. When the ship was commissioned in 1941, it was considered to be the world’s greatest sea weapon. It participated in every major naval offensive in the Pacific area of operations, lost only 10 men, and earned 15 battle stars. Visitors can explore all nine levels of the ship. Arrows lead you on the self-guided tour around the ship. You will learn what life was like onboard and see such sights as the mechanical room, mess hall, barbershop, shops, captain’s quarters, and so much more. It was so interesting to see where everyone slept, worked, and spent their time, and it definitely gave us a whole new level of appreciation for everyone in the Navy. Our last adventure was a stop at the Cameron Art Museum. One of the exhibits we perused during our visit was called State of the Art/Art of the State, which featured work from North Carolina artists. Artists were invited to bring one piece of art to the museum during a 24-hour period, and 637 artists participated in the event. The other exhibit was the North Carolina Arts Council Artist Fellowship 2017 Award Exhibition, which showcased work from 17 artists in North Carolina. We really enjoyed both exhibits. It was fun to see work from local artists, and there were some really fascinating pieces of art on display. We decided to grab a late lunch before heading to the airport for our flight home. 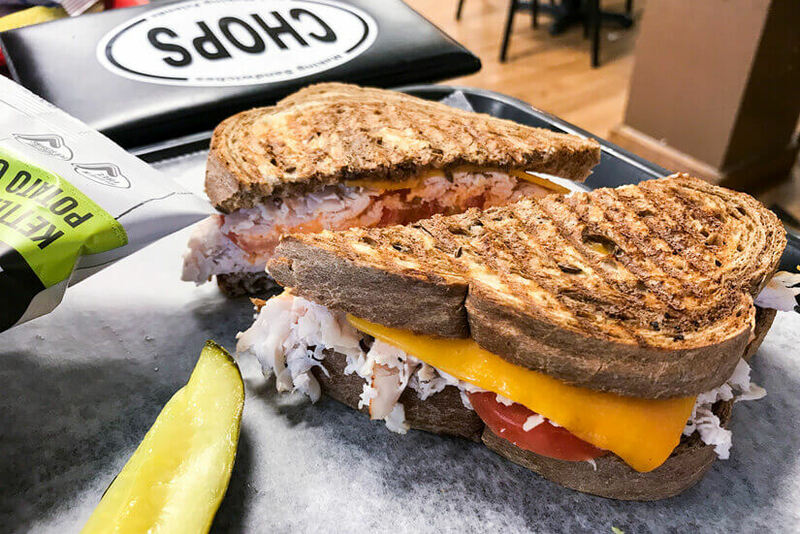 We wanted something fresh to offset all the indulgent meals we had over the weekend, and a return visit to Chops Deli made the cut. Fresh sandwiches were the perfect sendoff before we made our way back to the airport. Our weekend in Wilmington, North Carolina, was jam-packed. We had a blast learning about the history of the city, digging into the culinary scene, and just wandering around the city. We thoroughly enjoyed our weekend visit! We visited Wilmington, North Carolina, as part of a content project. Special thanks to Travel Mindset and Wilmington and Beaches CVB for hosting us on our adventures. As always, all opinions are our own. The Ghost Walk sounds like fun Jenna! I’d love to take that tour and heard how Wilmington is prominent on the paranormal scene. Lots of energies and spirits from the war I suspect. Thanks for sharing the rocking Wilmington review. Thanks, Ryan! It was a really great time, and yeah I could definitely see there being a lot of spirits hanging around from the war–would Love to hear even more stories next time! I once followed a ghost tour too in Quebec City, Québec, and absolutely adored it! It was dark at night and the actor/guide was sooooo good, we had goosebumps all over our arms the whole duration of the tour. The stories were the creepiest I ever heard and it was so strange reliving them. Anyway, your whole tour here seems like a lot of fun and food, as usual. Very interesting and yummy! thanks for taking us again! Yeah, Savory Cafe was a great spot for sure!